A couple of weeks ago we had the pleasure of going to Panama City, Florida for our annual visit to my in-laws. It was hot and humid, and daily swimming was a must. 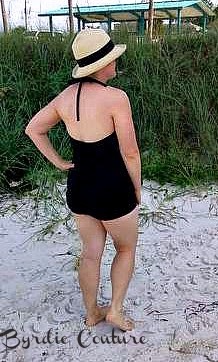 What more can I say about the Bombshell Swimsuit pattern from Closet Case Files? It is well-drafted, easy to sew, and looks great on a variety of body types. I used a matte black nylon-spandex from Spandex World. 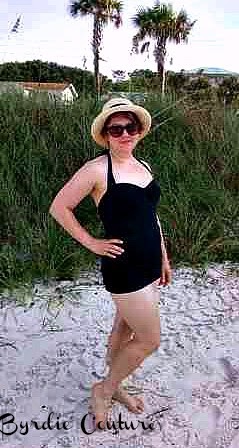 I also purchased a black swimsuit lining from them. I got the bra cups on Etsy. I didn't make any changes to the fit or construction. And, as I am one of the last members of the online sewing community to sew this, I will let you refer to the multitude of reviews from others who have gone before me. When we arrived back to New Mexico, the weather was already beginning to change. Fall is in the air and I am now planning my cool weather sewing plan. I really love this suit. It looks great on you!